Spring has sprung and you might be starting to feel like your skin, hair and nails need a bit of a boost. Whilst it’s great to have a solid beauty regime, your own tried and tested method for looking after your hair and your favourite hand cream on board, really we all know that great skin, hair and nails starts from within. We know we should eat our fruits an vegetables and get in plenty of protein and our fix of oily fish to keep things on track, but what about when you need a bit of a boost? One way to make sure you get some extra nutrients in your diet is by introducing a daily smoothie or juice full of goodness. Drinking these daily can have a huge impact on your skin, hair and nails and support things like your digestive system as well. For added ‘insurance’ an all round supplement is a good bet. Perfectil is the UK’s leading beauty supplement for skin, hair and nails. During my pregnancies and whilst I was breastfeeding I used the Pregnacare supplements from the same company. 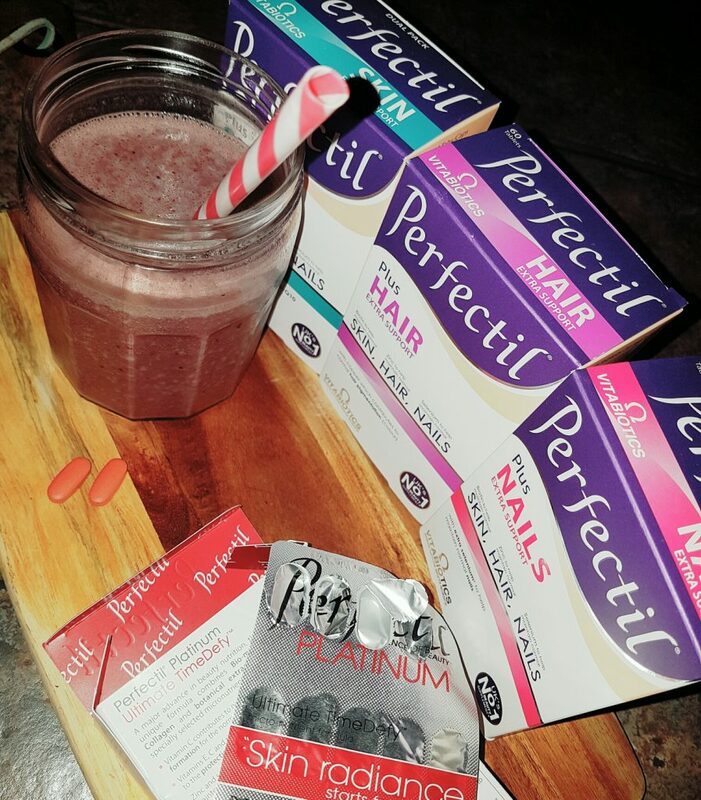 I felt as if it was a quality brand I could trust and that added piece of mind that my babies were getting everything they needed, as was I.
Perfectil is taken by Nicole Scherzinger, to improve her skin, hair and nails from the inside out, and if it’s good enough for Nicole right? Listen here to see what she has to say about the supplement and taking care of yourself. You can pick these up in Boots or Superdrug, or just purchase them online. There are a few different versions depending on your specific needs. The most important thing is that you don’t take them all at once as they are a complete vitamin, so you only need one type at a time. We can’t stop the ageing process sadly but we can delay it. Skin, hair and nails can suffer as we get older, this is one way of backing them up.